"Boise" redirects here. For other places called Boise, see Boise (disambiguation). Boise (/ˈbɔɪsi/ ( listen)) is the capital and most populous city of the U.S. state of Idaho, and is the county seat of Ada County. Located on the Boise River in southwestern Idaho, the population of Boise at the 2010 Census was 205,671, the 99th largest in the United States. Its estimated population in 2016 was 223,154. The Boise-Nampa metropolitan area, also known as the Treasure Valley, includes five counties with a combined population of 709,845, the most populous metropolitan area in Idaho. It contains the state's three largest cities; Boise, Nampa, and Meridian. Boise is the 80th most populous metropolitan statistical area in the United States. Accounts differ regarding the name's origin. One account credits Capt. B.L.E. Bonneville of the U.S. Army as its source. After trekking for weeks through dry and rough terrain, his exploration party reached an overlook with a view of the Boise River Valley. The place where they stood is called Bonneville Point, located on the Oregon Trail east of the city. According to the story, a French-speaking guide, overwhelmed by the sight of the verdant river, yelled "Les bois! Les bois!" ("The woods! The woods! ")—and the name stuck. The name may instead derive from earlier mountain men who named the river that flows through it. In the 1820s, French Canadian fur trappers set trap lines in the vicinity. Set in a high-desert area, the tree-lined valley of the Boise River became a distinct landmark, an oasis dominated by cottonwood trees. They called this "La rivière boisée", which means "the wooded river." Most native and longtime residents use the pronunciation /ˈbɔɪsiː/ (BOY-see), as given on the city's website. The pronunciation is sometimes used as a shibboleth, as outsiders (and newcomers) tend to pronounce the city's name as /ˈbɔɪziː/ (BOY-zee). Boise is in southwestern Idaho, about 41 miles (66 km) east of the Oregon border, and 110 miles (177 km) north of the Nevada border. The downtown area's elevation is 2,704 feet (824 m) above sea level. 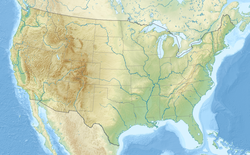 According to the United States Census Bureau, the city has an area of 80.05 square miles (207.33 km2), of which, 79.36 square miles (205.54 km2) is land and 0.69 square miles (1.79 km2) is water. The city is drained by the Boise River. The City of Boise is considered part of the Treasure Valley. Boise occupies a large area — 64 sq mi (170 km2) according to the United States Census Bureau. Like all major cities, it has several neighborhoods, including the Bench, the North End, West Boise and Downtown. In January 2014, the Boise Police Department (BPD) partnered with the folksonomic neighborhood blogging site Nextdoor, the first city in the Northwest and the 137th city in the U.S. to do so. Since the app, which enables the city's police, fire, and parks departments to post to self-selected, highly localized areas, first became available in October 2011, 101 neighborhoods and sections of neighborhoods have joined. Downtown Boise is Boise's cultural center and home to many small businesses and a few mid-rises. While downtown Boise lacks a major retail/dining focus like Seattle and Portland, the area has a variety of shops and growing option for dining choices. Centrally, 8th Street contains a pedestrian zone with sidewalk cafes and restaurants. The neighborhood has many local restaurants, bars and boutiques and supports a vibrant nightlife. The area contains the Basque Block, which gives visitors a chance to learn about and enjoy Boise's Basque heritage. Downtown Boise's main attractions include the Idaho State Capitol, the classic Egyptian Theatre on the corner of Capitol Boulevard and Main Street, the Boise Art Museum on Capitol in front of Julia Davis Park, and Zoo Boise on the grounds of Julia Davis Park. Boise's economy was threatened in the late 1990s by commercial development at locations away from the downtown center, such as Boise Towne Square Mall and at shopping centers near new housing developments. The North End, generally defined as the part of Boise north of State Street, contains many of the city's older homes. It is known for its tree-lined drives such as Harrison Boulevard, and for its quiet neighborhoods near the downtown area. Downtown Boise is visible from Camel's Back Park. On 13th Street, Hyde Park is home to restaurants and other businesses. The North End also hosts events such as the annual Hyde Park Street Fair. In 2008, the American Planning Association designated Boise's North End one of 10 Great Neighborhoods. The Boise Highlands is just north of the North End. Its location is generally defined as north of Hill Road, East of Bogus Basin Road. Its neighborhood is mostly filled with homes constructed in the 1970s, as well as a golf course/country club known as Crane Creek. Warm Springs is centered on the tree-lined Warm Springs Avenue and contains some of Boise's largest and most expensive homes (many of which were erected by wealthy miners and businessmen around the turn of the 20th century; Victorian styles feature prominently). The area gets its name from the natural hot springs that flow from Boise's fault line and warm many of the area's homes. The Natotorium public swim center is here. The newest Boise Public Library branch branch at Bown Crossing. Southeast Boise spans from Boise State University to Micron Technology – all areas between Federal Way and the Boise River. The older area just south of the university can be described as a cross between the North End and the Boise bench. The rest of Southeast Boise was developed in the last thirty years with suburban-style homes. Columbia Village subdivision and the older Oregon Trail Heights were the first major planned communities in Southeast Boise with an elementary and middle school all within walking distance from all homes. The subdivision is at the intersections of Interstate 84, Idaho 21, and Federal Way (former U.S. Highway), which are all major arteries to get anywhere in Boise. The subdivision, a baseball complex, and swimming pools were developed around the Simplot Sports complex. The fields are built over an old landfill and dump, and the fields and gravel parking lot allow radon gases to escape through the ground. The most recent planned community is the 35 acre Bown Crossing which has easy access to the Boise Greenbelt. On August 25, 2008 at about 7:00 pm, a fire started near Amity and Holcomb during a major windstorm. It destroyed ten houses and damaged nine. One person died in the fire. The Bench, generally bounded by Federal Way to the east, Cole Road to the west and Garden City to the north, sits on an elevation approximately 60 feet (18 m) higher than downtown Boise to its northeast. Orchard Street is a major north-south thoroughfare in the neighborhood. The Bench is so named because this sudden rise, giving the appearance of a step, or bench. The Bench (or Benches, there are three actual benches in the Boise Valley) was created as an ancient shoreline to the old river channel. The Bench is home to the Boise Union Pacific Depot. Like the North End, the Bench has older residential areas such as the Central Rim, Morris Hill, and Depot Bench neighborhoods. Due south of the Bench is the Boise Airport. West Boise is home to Boise Towne Square Mall, the largest in the state, as well as many restaurants, strip malls, and residential developments ranging from new subdivisions to apartment complexes. The Ada County jail and Hewlett Packard's printing division are also here. It is relatively the flattest section of Boise, with sweeping views of the Boise Front. West Boise also borders the city of Meridian. Boise has a semi-arid continental climate (Köppen climate classification BSk), with four distinct seasons. Boise experiences hot and dry summers with highs reaching 100 °F (38 °C) eight days in a typical year and 90 °F (32 °C) on 51 days. Yet because of the aridity, average diurnal temperature variation exceeds 30 °F (17 °C) in summer. Winters are moderately cold, with a December average of 26.7 °F (−2.9 °C), and lows falling to 0 °F (−18 °C) or below on around three nights per year. Snowfall averages 35.2 inches (89 cm), but typically falls in bouts of 3 inches (8 cm) or less. Spring and fall are mild. Autumn is brief; spring is gradual. Extremes have ranged from −30 °F (−34 °C) on January 16, 1888 to 111 °F (44 °C), as recently as July 19, 1960; temperatures have reached −27 °F (−33 °C) and 110 °F (43 °C) as recently as December 22, 1990 and June 28, 2015, respectively. Precipitation is usually infrequent and light, especially so during the summer months. It averages approximately 13 inches annually. Tornadoes are rare in Ada County and the Boise area. Since 1950, only twelve tornadoes have been documented within the county, and four of those were during the same storm on August 3, 2000, which is also the most recent date a tornado was documented in the area. None of the tornadoes have been ranked higher than an "F1" on the Fujita scale, and no injuries or fatalities were ever documented. As of the census of 2010, there were 205,671 people, 85,704 households, and 50,647 families residing in the city. The population density was 2,591.6 inhabitants per square mile (1,000.6/km2). There were 92,700 housing units at an average density of 1,168.1 per square mile (451.0/km2). The city's racial makeup was 89.0% White, 1.5% African American, 0.7% Native American, 3.2% Asian, 0.2% Pacific Islander, 2.5% from other races, and 3.0% from two or more races. Hispanic or Latino people of any race were 7.1% of the population. There were 85,704 households, of which 29.6% had children under the age of 18 living with them, 44% were married couples living together, 10% had a woman householder with no husband present, 4.5% had a man householder with no wife present, and 41% were non-families. 31% of all households were made up of individuals and 8.5% had someone living alone who was 65 years of age or older. The average household size was 2.36 and the average family size was 3. The median age in the city was 35. 23% of residents were under the age of 18; 11% were between the ages of 18 and 24; 29% were from 25 to 44; 26% were from 45 to 64; and 11% were 65 years of age or older. The city's gender makeup was 49% men and 51% women. 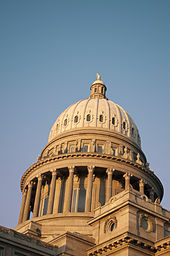 Boise is the headquarters for several major companies, such as Boise Cascade LLC, Albertsons, J.R. Simplot Company, Idaho Pacific Lumber Company, Idaho Timber, WinCo Foods, Bodybuilding.com, and Clearwater Analytics. Other major industries are headquartered in Boise or have large manufacturing facilities present. The state government is one of the city's largest employers. Technology investment and the high-tech industry have become increasingly important to the city, with businesses including Hewlett Packard, Healthwise, Bodybuilding.com, CradlePoint, Crucial.com, ClickBank, MetaGeek, MobileDataForce, MarkMonitor, Sybase, Balihoo, Intracon NA, Wire Stone, and Microsoft. The call center industry is also a major source of employment; there are over 20 call centers in the city employing more than 7,000 people, including WDSGlobal (a Xerox company), EDS, Teleperformance, DIRECTV, Taos and T-Mobile. Varney Air Lines, founded by Walter Varney in 1926, was formed in Boise, though headquartered at Pasco, Washington. The original airmail contract was from Pasco to Elko, Nevada, with stops in Boise in both directions. Varney Air Lines is the original predecessor company of present-day United Airlines, which still serves the city at the newly renovated and upgraded Boise Airport. Boise is a regional hub for jazz, theater, and indie music. The Gene Harris Jazz Festival is hosted in Boise each spring. Several theater groups operate in the city, including the Idaho Shakespeare Festival, Boise Little Theatre, Boise Contemporary Theater, and ComedySportz Boise, among others. The Treefort Music Fest in late March features emerging bands, as well as many other artistic endeavors, and has perforce "morphed from quirky music festival to consuming community event," and the HomeGrown Theatre is notable for continuing the avant garde satirical tradition of puppetry for millennials. The renovated Egyptian Theatre hosts national and regional music acts, comedians, and special film screenings . The Boise City Department of Arts and History was created in 2008 with the goal of promoting the arts, culture, and history of the city among its residents and visitors. Since 1978 Boise had a public arts commission like many cities to promote public art and education. The Arts Commission provided expert advice on public art installations to the city and private groups, as well as to develop many educational programs within the city promoting the arts. In 2008 the city and the Arts Commission made the decision to introduce history into the scope of the art commission and rename this new commission the Boise City Department of Arts and History. The Boise City Department of Arts and History oversees several ongoing projects and programs related to art, culture, and history, and a number of short-term projects at any given time. Ongoing projects include maintenance of a public art collection valued at over $3 million, creation and maintenance of city historical and art walks and tours, maintenance of a city historical research collection, artists in residence, and the Fettuccine Forum. In 2013, Boise celebrated its sesquicentennial, the commemoration was also known as the Boise 150. The commemoration was led by the City of Boise's Department of Arts & History. The Department of Arts & History focused the commemoration on the themes of Enterprise, Community, and Environment. For the sesquicentennial year, the Department of Arts and History inhabited a storefront at 1008 Main St. This Boise 150 headquarters, also known as the Sesqui-Shop operated as a store, exhibit space, and event venue. Local merchants produced authentic local products as part of the sesquicentennial. Sesquicentennial events included Thinking 150, Anniversary Weekend, Re-Art Children's Program, Sesqui-Speaks, and Walk 150. Legacy pieces of the sesquicentennial included the Share Your Story Program, a Commemorative book featuring local writers, and a commemorative CD featuring local musicians. As part of the sesquicentennial, the Department of Arts & History also awarded a Legacy Grant to the Shoshone-Bannock Culture Committee, as well as 36 smaller community grants. The Boise Centre on the Grove is an 85,000-square-foot (7,900 m2) convention center that hosts a variety of events, including international, national, and regional conventions, conferences, banquets, and consumer shows. It is in the heart of downtown Boise and borders the Grove Plaza, which hosts many outdoor functions throughout the year including the New Year's Eve celebration, the Idaho Potato Drop hosted by the Idaho New Year's Commission. The Morrison-Knudsen Nature Center offers a streamwalk with water features and wildlife experiences just east of downtown. It is next to Municipal Park. It features live fish and wildlife exhibits, viewing areas into the water, bird and butterfly gardens, waterfalls and a free visitor's center. Boise has diverse and vibrant religious communities. The Jewish community's Ahavath Beth Israel Temple, completed 1896, is the nation's oldest continually used temple west of the Mississippi. The Church of Jesus Christ of Latter-day Saints dedicated a temple there in 1984. The Boise Hare Krishna Temple opened in August 1999. In 1972, John Waters set the final scene of his film Pink Flamingos in Boise. Boise's sister cities are Chita, Zabaykalsky Krai, Russia and Gernika, Spain. Boise offers many recreational opportunities, including extensive hiking and biking in the foothills to the immediate north of downtown. Much of this trail network is part of Hull's Gulch and can be accessed by 8th street. An extensive urban trail system called the Boise River Greenbelt runs along the river and through Pierce Park. The Boise River is a common destination for fishing, swimming and rafting. 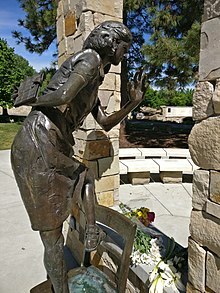 Boise is the site of the only human rights memorial in the U.S., the Anne Frank Human Rights Memorial, located next to its main library. The World Center for Birds of Prey is just outside city, and is a key part of the re-establishment of the peregrine falcon and the subsequent removal from the endangered species list. The center is breeding the rare California condor, among many other rare and endangered species. Publications such as Forbes, Fortune and Sunset have cited the city for its quality of life. An article published by Forbes in 2018 named Boise the fastest-growing city in America. Its population of around 220,000 grew 3.08% in 2017, as well as employment by 30.58%. The cornerstone mall in Boise, Boise Towne Square Mall, is also a major shopping attraction for Boise, Nampa, Caldwell, and surrounding areas. The mall received upgrades and added several new retailers in 1998 and 2006. Home prices, a proxy for wealth, increased 11.58%--number four in the U.S. Violent crimes dropped from 775 incidences in 2006 to 586 in 2007, but murders increased from 2004 to 2007. In 2007, there were 3,211 crimes per 100,000 residents. Despite population growth, violent crime has remained much the same as of 2013, with 600 incidents of violent crime in that year. The Boise School District includes 31 elementary schools, eight junior high schools, five high schools, and two specialty schools. Part of the West Ada School District (now the largest in Idaho) is within the Boise city limits, and the city is therefore home to six public high schools: Boise, Borah, Capital, Timberline, the alternative Frank Church, and the West Ada School district's Centennial. Boise's private schools include the Catholic Bishop Kelly, Foothills School of Arts and Sciences, One Stone High School and the International Baccalaureate-accredited Riverstone International School. The major Interstate serving Boise is I-84, which connects Boise with Portland, Oregon, and Salt Lake City, Utah. In addition, residents in the Boise area are served with Interstate 184 (locally known as "The Connector"), a nearly 5-mile (8 km) stretch of freeway connecting I-84 with the downtown Boise area. Highway 55 branches outward northeast. There is a network of bike paths, such as the Boise River Greenbelt, throughout the city and surrounding region. Among US cities, Boise has the seventh highest amount of bicycle commuters per capita with 3.9% of commuters riding to work. Public transportation includes a series of bus lines operated by ValleyRide. In addition, the Downtown Circulator, a proposed streetcar system, is in its planning stage. The construction of the underground public transportation hub (UPT Hub) in Boise in the parking lot site near the intersection of W Main Street and N 8th Street was completed in 2016. Commercial air service is provided at the Boise Airport. The terminal was recently renovated to accommodate the growing number of passengers flying in and out of Boise. It is served by Allegiant Air, Alaska Airlines, American Airlines, Delta Air Lines, Southwest Airlines, and United Airlines. The airport's east end is home to the National Interagency Fire Center. The Gowen Field Air National Guard Base occupies the south side of the field. Amtrak passenger train service was available at Boise Union Pacific Depot until May 10, 1997, when Amtrak discontinued the service. Previously, since 1977, the Pioneer had twice-daily service through Boise as the train made its way between Seattle and Chicago (via Salt Lake City/Ogden and Denver). A short line railroad (Boise Valley Railroad) serves industries in Boise. 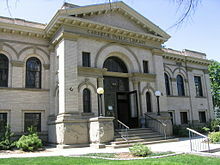 Boise's Carnegie Public Library opened in 1905 on Washington St. and remained at that site until the library moved in 1973. Zions Bank Building, completed in early 2014, is the tallest building in Boise. The Ridenbaugh Canal, constructed in 1878, provides for leisurely recreational activities in SE Boise for most if not all of its route; the median S. Federal Way is on the upper left. ^ Official records have been kept at downtown Boise from January 1875 to December 1939, and at Boise Air Terminal (Airport) since January 1940. For more information, see ThreadEx. ^ a b "Population and Housing Unit Estimates". Retrieved July 8, 2018. ^ a b "About Boise". Cityofboise.org. Archived from the original on February 9, 2012. Retrieved November 28, 2012. ^ Population Estimate, U.S. Census. "Annual Estimates of the Resident Population: April 1, 2010 to July 1, 2016". ^ "The name "Boise"" (PDF). IdahoHistory.net. July 7, 2010. Archived from the original (PDF) on September 30, 2009. Retrieved November 28, 2012. ^ Suplee, Curt (November 30, 1986). "Idaho: a land of wild paradoxes". Toledo Blade. -Ohio. Los Angeles Times news service. p. F7. ^ O'Mara, Maggie (September 18, 2009). "BLOG: Boise or Boize? Get it right people... PLEASE. | KTVB.COM Boise". Ktvb.com. Archived from the original on May 27, 2014. Retrieved 2012-11-28. ^ "Boise Police Department joins Nextdoor". Police.cityofboise.org. January 27, 2014. Archived from the original on February 1, 2014. Retrieved August 19, 2014. ^ "Idahostatesman.com Boise, ID". February 6, 2014. Archived from the original on February 6, 2014. ^ "Boise, Meridian, Nampa, Caldwell news by Idaho Statesman". Idahostatesman.com. Retrieved August 19, 2014. ^ "Welcome to BAM". Boiseartmuseum.org. Retrieved November 28, 2012. ^ "Home". Zooboise.org. Retrieved November 28, 2012. ^ "Downtown Boise Association". Downtownboise.org. Archived from the original on April 11, 2012. Retrieved November 28, 2012. ^ "Downtown Boise Association". Downtownboise.org. November 1, 2012. Archived from the original on February 11, 2012. Retrieved November 28, 2012. ^ "Benjamin Victor Gallery and Studio at Boise State University". Benjamin Victor, Professor of the Practice. Retrieved June 16, 2017. ^ "A Northend History". Archived from the original on July 4, 2015. Retrieved June 23, 2015. ^ a b c "Boise Parks & Recreation — City of Boise". Parks.cityofboise.org. November 21, 2012. Retrieved November 28, 2012. ^ "Northend.org". Northend.org. Archived from the original on July 17, 2006. Retrieved November 28, 2012. ^ "Great Places in America". Planning.org. February 24, 2011. Retrieved November 28, 2012. ^ Webb, Anna (April 12, 2017). "10 fun facts about Boise's newest library opening Thursday". The Idaho Statesman. Retrieved January 17, 2018. ^ KATY MOELLER, KATY (December 15, 2017). "Man behind Boise library's exclamation point tells story; mayor eats crow". The Idaho Statesman. Retrieved January 18, 2018. ^ n/a, n/a (January 18, 2018). "Bown Crossing". City of Boise. ^ "Loose electrical connection blamed for Boise fire". KTVB. October 14, 2009. Archived from the original on March 9, 2016. Retrieved February 19, 2016. ^ "Boise Airport". iFlyBoise. Retrieved November 28, 2012. ^ a b c "NowData — NOAA Online Weather Data". National Oceanic and Atmospheric Administration. Retrieved November 30, 2012. ^ "NCDC: U.S. Climate Normals" (PDF). National Oceanic and Atmospheric Administration. Archived from the original (PDF) on July 12, 2014. Retrieved May 15, 2010. ^ "Ada County, Idaho". Tornado History Project. Retrieved August 19, 2015. ^ "Threaded Extremes". Threadex.com. Retrieved January 2, 2018. ^ "NowData – NOAA Online Weather Data". National Oceanic and Atmospheric Administration. Retrieved January 6, 2012. ^ "Station Name: ID BOISE AIR TERMINAL". National Oceanic and Atmospheric Administration. Retrieved March 18, 2014. ^ "WMO Climate Normals for BOISE/AIR TERMINAL ID 1961–1990". National Oceanic and Atmospheric Administration. Retrieved March 10, 2014. ^ "Boise Companies — Economic Development". Boiseidaho.gov. Retrieved November 28, 2012. ^ "Intracon Holding GmbH". Intracon.com. November 9, 2012. Retrieved November 28, 2012. ^ "Call-center industry rises here". Spokane Journal of Business. January 12, 2001. Retrieved August 15, 2007. ^ "Top Employers in the Boise Valley | Expand and Relocate | Boise Valley Economic Partnership". www.bvep.org. Archived from the original on November 18, 2016. Retrieved November 17, 2016. ^ Hagadone, Zach. "Fortress Boise". Boiseweekly.com. Retrieved January 2, 2018. ^ "Let the music play: Treefort underway in Boise - Treefort Music Fest …". April 4, 2015. Archived from the original on April 4, 2015. ^ Berry, Harrison (December 12, 2017). "Horrific Puppet Affair Finds Humor in the Space Between Halloween and Christmas". Boise Weekly. Retrieved December 12, 2017. ^ Burton, Brooke (December 20, 2017). "Puppetry, Pantomime, & Projections: HomeGrown Theatre's Shortcut to Spectacle". Boise City Department of Arts & History. Retrieved December 20, 2017. ^ Inc., North American Basque Organizations,. "U.S. Basque Population". www.nabasque.org. Retrieved May 25, 2016. ^ "Boise Art Museum". Boise Art Museum. Retrieved January 26, 2014. ^ "The Boise Philharmonic Homepage". Boise Philharmonic. Retrieved November 28, 2012. ^ "Ballet Idaho". Ballet Idaho. Retrieved November 28, 2012. ^ Macaulay, Alastair (August 6, 2010). "Dance Review — Trey McIntyre Project's Ballets at Jacob's Pillow". Massachusetts: NYTimes.com. Retrieved November 28, 2012. ^ "Trey McIntyre Project". Treymcintyre.com. Retrieved November 28, 2012. ^ "Velma V. Morrison Center for the Performing Arts Official Home Page". Mc.boisestate.edu. Retrieved November 28, 2012. ^ "Opera Idaho". Opera Idaho. Retrieved November 28, 2012. ^ "March 8, 2008 Boise City Council Minutes" (PDF). Clerks Office, City of Boise. Retrieved March 6, 2013. ^ "Tour Maps". Boise City Department of Arts and History. Archived from the original on April 7, 2013. Retrieved 2013-03-07. ^ "Research Collection". Boise City Department of Arts and History. Retrieved March 7, 2013. ^ "Artists in Residence". Boise City Department of Arts and History. Archived from the original on April 7, 2013. Retrieved 2013-03-07. ^ "Fettuccine Forum". Boise City Department of Arts and History. Archived from the original on April 7, 2013. Retrieved 2013-03-07. ^ "research study" (PDF). Americans for the Arts. Archived from the original (PDF) on May 20, 2013. Retrieved March 7, 2013. ^ "New Year's Eve Party Boise Idaho - Idaho Potato Drop". Idahonewyearscommission.com. Retrieved January 2, 2018. ^ "VNN USA — Mayor To Open New Boise Temple". Vnn.org. Archived from the original on February 25, 2012. Retrieved November 28, 2012. ^ "Sister Cities & States". The Official Website of the State of Idaho. Retrieved January 8, 2018. ^ "Zoo Boise Event Details". Archived from the original on August 1, 2008. Retrieved 2009-02-28. ^ "Utah Local News — Salt Lake City News, Sports, Archive — The Salt Lake Tribune". Sltrib.com. October 4, 2010. Retrieved November 28, 2012. ^ "Spudtown Knockdown returns to Boise | KTVB.COM Boise". Ktvb.com. September 3, 2011. Archived from the original on November 23, 2011. Retrieved 2012-11-28. ^ Darr, Deanna. "Spudtown Knockdown | Rec Extra". Boise Weekly. Retrieved November 28, 2012. ^ "Bronco Stadium and The Blue". Boise State Football. Archived from the original on November 4, 2012. Retrieved 2012-11-28. ^ Webb, Anna (June 1, 2017). "Bieter urges crowd to 'stand up to power' at anti-hate Anne Frank Memorial ceremony". The Idaho Statesman. ^ "Giant sequoia trees (Sequoiadendron giganteum) in Idaho". Monumentaltrees.com. Retrieved November 28, 2012. ^ "Boise Police" (PDF). Cityofboise.org. November 16, 2012. Archived from the original (PDF) on March 11, 2012. Retrieved November 28, 2012. ^ "Best High Schools USNews Rankings 2013". Usnews.com Education. Retrieved May 11, 2013. ^ "First law school opens in Boise". August 27, 2012. Archived from the original on June 28, 2014. Retrieved 13 February 2013. ^ "Boise 2nd and 3rd Year Program-College of Law-University of Idaho". Uidaho.edu. Archived from the original on May 8, 2015. Retrieved August 19, 2014. ^ "Boise's Basque Preschool thrives and expands into a new home". ^ "Boiseko ikastola, July 18, 2013". Boisekoikastola.org. Retrieved August 19, 2014. ^ "Census Bureau Homepage". Census.gov. November 19, 2012. Retrieved November 28, 2012. ^ "About the Boise Streetcar". City of Boise. Archived from the original on March 31, 2009. Retrieved November 17, 2009. ^ Zach Hagadone. "Idaho's Lone Amtrak Station Undergoing Renovation". boiseweekly.com. Boise Weekly. Retrieved August 19, 2015. ^ Johnston, Bob (August 1997). "The Pioneer's last stand". Trains: 24–26. ^ "Pioneer Inaugural Run Brings Out The People". Amtrak NEWS 4 (11). June 15, 1977. Retrieved February 4, 2015. ^ "BoDo Development". The Boise Wiki. Archived from the original on March 25, 2012. Retrieved June 2, 2012. 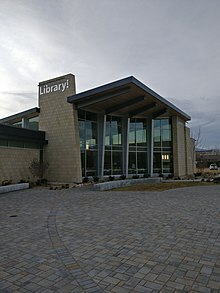 ^ "History of Boise's Library". Boise Public Library. Archived from the original on July 25, 2011. Retrieved June 2, 2012. ^ Elsner, David (August 6, 1988). "William Agee". chicagotribune.com. Retrieved September 25, 2013. ^ "Kathryn Albertson". J.A. and Kathryn Albertson Foundation. Retrieved September 25, 2012. ^ Engelberg, Stephen (May 12, 1987). "JAMES ANGLETON, COUNTERINTELLIGENCE FIGURE, DIES". New York Times. Retrieved March 19, 2017. ^ "Steve Appleton". .idahostatesman.com. Retrieved September 25, 2013. ^ "Kristin Armstrong". United States Olympic Committee. Retrieved September 25, 2013. ^ "Matthew Barney". The New York Times Company. Retrieved September 25, 2013. ^ "Bill Buckner". Minor League Baseball. Retrieved September 25, 2013. ^ "Maggie Carey". idahostatesman.com. Retrieved September 25, 2013. ^ "Cassidy Takes Council Seat of Callicott". Los Angeles Times: 17. December 8, 1962. ^ "Biography". James Castle Collection and Archive. Retrieved October 6, 2015. ^ Geiling, Natasha. "A World Of His Own: The Art of James Castle". Smithsonian.com. Smithsonian Institution. Retrieved October 6, 2015. ^ "Frank Church". Biographical Directory of the United States Congress. Retrieved September 25, 2013. ^ "Heather Cox Bio". Archived from the original on November 18, 2018. ^ “Survivor: Heroes vs. Healers vs. Hustlers.” Wikipedia, Wikimedia Foundation, 28 Mar. 2019, en.wikipedia.org/wiki/Survivor:_Heroes_vs._Healers_vs._Hustlers. ^ "John M. Haines". National Governors Association. Retrieved September 25, 2013. ^ Ratliff, Ben (January 18, 2000). "Gene Harris". The New York Times Company. Retrieved September 25, 2013. ^ "Michael Hoffman". Boise State University. Archived from the original on September 28, 2013. Retrieved 25 September 2013. ^ "ERNIE HUGHES". profootballarchives.com. Archived from the original on November 29, 2014. Retrieved November 18, 2014. ^ "Howard W. Hunter". Intellectual Reserve Inc. Retrieved September 25, 2013. ^ "Eilen Jewell". boiseweekly.com/boise. Retrieved September 25, 2013. ^ "Scott Jorgensen". Ultimate Fighting Championship. Retrieved September 25, 2013. ^ "Dirk Kempthorne". Biographical Directory of the United States Congress. Retrieved September 25, 2013. ^ "Bonnie McCarroll". National Cowboy & Western Heritage Museum. Retrieved September 26, 2013. ^ Duffy, Rónán (October 24, 2015). "Irish-American movie star Maureen O'Hara has died aged 95". The Journal. Retrieved October 24, 2015. ^ Elaine Edwards (October 24, 2015). "Actor Maureen O'Hara dies aged 95". Irishtimes.com. Retrieved October 24, 2015. ^ "Thom Pace Artist Page". iTunes. Retrieved February 20, 2018. ^ "William Petersen". Idaho State University. Archived from the original on April 14, 2013. Retrieved September 26, 2013. ^ Shipley, Amy (February 25, 2006). "Jeret Peterson". The Washington Post. Retrieved September 26, 2013. ^ "Jake Plummer". pro-football-reference.com. Retrieved September 26, 2013. ^ "Paul Revere". idahostatesman.com. Retrieved September 26, 2013. ^ "Brian Scott". idahostatesman.com. Retrieved September 26, 2013. ^ "ComicCon: Jeremy Shada voice of 'Adventure Time's' Finn, sees show's impact on fans". Lexington Herald-Leader. Retrieved April 24, 2018. ^ "Frank Shrontz". Zoom Information, Inc. Retrieved September 26, 2013. ^ "Robert E. Smylie". National Governors Association. Retrieved September 26, 2013. ^ "Michael J. Squier". .defense.gov. Archived from the original on September 28, 2013. Retrieved September 26, 2013. ^ "Gary L. Stevens". voice-tribune.com. Archived from the original on September 28, 2013. Retrieved 26 September 2013. ^ Fletcher, Rebecca (June 30, 2018). "Celebrity traveller Curtis Stigers". Express.co.uk. Retrieved August 28, 2018. ^ "18 Behind-The-Scenes Photos That Completely Change Buffy The Vampire Slayer". ScreenRant. June 26, 2018. Retrieved August 28, 2018. ^ "8 Buffy plot holes the reboot could fill up". Digital Spy. August 7, 2018. Retrieved August 28, 2018. ^ "Billy Uhl". motorcyclemuseum.org. Retrieved January 21, 2015. ^ "Benjamin Victor Professor of the Practice". Benjamin Victor, Professor of the Practice. Retrieved June 16, 2017. ^ "Wayne Walker". Pro-Football Reference.com. Retrieved September 26, 2013. MacGibbon, Elma (1904). Leaves of knowledge. Shaw & Borden Co. Available online through the Washington State Library's Classics in Washington History collection Elma MacGibbons reminiscences of her travels in the United States starting in 1898, which were mainly in Oregon and Washington. Includes chapter "Boise, the capital of Idaho". Wikivoyage has a travel guide for Boise.